The latest Ebola outbreak has claimed almost 900 lives in West Africa. Despite warnings from health officials villagers in West Africa continue to purchase and eat bats, rodents and bush meat. Scientists report that Ebola may be present in more animals than previously thought. So far, it has been detected in chimpanzees, gorillas, fruit bats, monkeys, antelopes, porcupines, rodents, dogs, pigs and humans. In 2012 investigators in Canada were making headlines of their own with research indicating the deadly virus may spread between species, through the air. Secondary transmission of Ebola virus infection in humans is known to be caused by direct contact with infected patients or body fluids. We report transmission of Ebola virus (Zaire strain) to two of three control rhesus monkeys (Macaca mulatta) that did not have direct contact with experimentally inoculated monkeys held in the same room. The two control monkeys died from Ebola virus infections at 10 and 11 days after the last experimentally inoculated monkey had died. The most likely route of infection of the control monkeys was aerosol, oral or conjunctival exposure to virus-laden droplets secreted or excreted from the experimentally inoculated monkeys. These observations suggest approaches to the study of routes of transmission to and among humans. 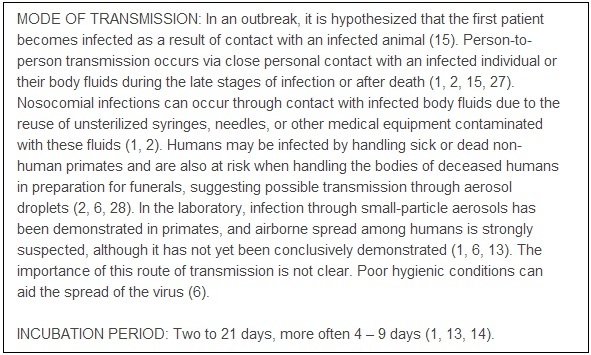 Even OSHA reported on the possible transmission of Ebola through aerosol droplets. We may just be seeing the start of a colossal outbreak. 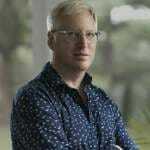 UPDATE: I spoke with my cousin Dr. Dan Hoft M.D. Ph.D. an expert in infectious disease at St. Louis University Hospital. Dan is the Director of the new Division of Immunobiology. Dan helped save my life last year during my battle with a Strep infection that caused several strokes, put out an eye and damaged my heart. So, obviously, I trust him with my life. Dr. Dan told me there has never been a documented case of airborne transmission of Ebola. However, he is concerned with the spread of this strain in West Africa. He will keep me updated if he hears more on this epidemic.